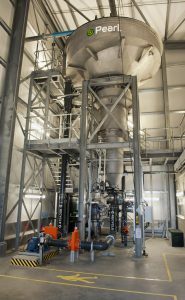 Phosphorus recovery is gaining momentum in Europe, says Andrea Gysin of Ostara Nutrient Recovery Technologies. The European Union’s adoption of the Circular Economy Package in January 2018 and new fertilizer regulations expected later this year are expected to further stimulate increased recovery and reuse of nutrients such as phosphorus. Ostara’s Pearl® and WASSTRIP® technologies recover nutrients from sludge liquors – pre and post-anaerobic digestion – in the form of Crystal Green®, which is sold as a high purity fertilizer by treatment plant operators for a guaranteed revenue stream. In 1993, the American architect and sustainability thought leader William McDonough proclaimed during a presentation in New York that “the things we make must not only rise from the ground but return to it, soil to soil, water to water, so everything that is received from the earth can be freely given back without causing harm to any living system. This is ecology. This is good design.” The philosophy would become the cornerstone of his life’s work, captured in the seminal book Cradle to Cradle: Remaking the Way We Make Things that McDonough co-authored in 2002 with German chemist Michael Braungart. Early on, it appears that McDonough not only understood the detrimental impact that nutrients would come to have on our waterways but also seemed to foreshadow the movement that has grown within the wastewater sector over the last couple of decades to combat and reverse it. 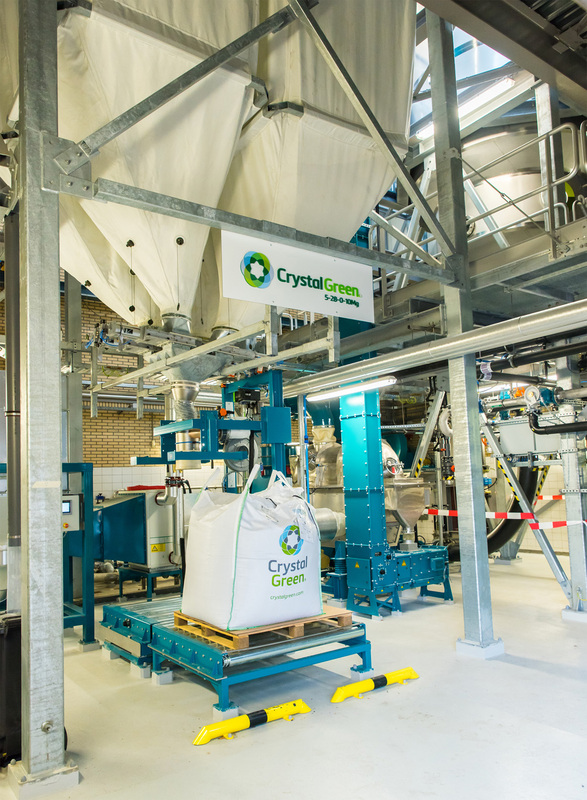 Ostara’s nutrient recovery facilities in Europe – Amersfoort (Netherlands), Madrid (Spain), and Slough, United Kingdom – recover phosphorus to produce Crystal Green®, a struvite-based environmentally responsible fertilizer used in agriculture. The European Union (EU) has regulated phosphorus (P) discharges from wastewater treatment works for almost two decades and in 2000 introduced the most comprehensive water legislation yet, the Water Framework Directive (WFD). What sets the WFD apart from previous regulation is that rather than limiting pollutant levels in discharges to our water bodies, it considers the ecological status of water bodies themselves with the objective of achieving “good” ecological status. The extent to which member states have implemented the WFD has varied owing largely to historical differences in phosphorus discharges imposed by national regulations. In Scandinavian countries, for example, low P limits have been a ﬁxture for many years in an attempt to reverse the eutrophication of the Baltic. Other countries have further to go – in England, for example, 53 percent of water bodies are not achieving “good” status with respect to P. As a result, wastewater treatment plants will be faced with increasingly tight phosphorus limits between now and 2021. Increasing concern has given rise to rigorous actions that go beyond geographical borders bound by EU regulation. HELCOM, the Baltic Marine Environment Protection Commission, also known as the Helsinki Commission, introduced the Baltic Sea Action Plan (BSAP), which has ambitious plans to restore the good ecological status of the Baltic marine environment by 2021. Adopted by the EU coastal states and Russia in 2007, the plan calls for phosphorous emissions into the Baltic to be reduced by more than 40 percent, or more than 15,000 metric tons per year. The nine participating countries have agreed to speciﬁc nutrient reduction targets, of which Poland has by far the largest reduction target at 8,760 metric tons per year, or 57 percent of the total. While environmental protection has long been a feature of European policy, the shift toward the circular economy – closing the loop of product lifecycles – resulted in the adoption of the Circular Economy Package in January 2018. The overarching goal of the package is to increase the sustainability of Europe’s economy by stimulating increased recovery, recycling, and reuse of secondary materials. Measures include amendments to existing legislation, such as the Waste Framework Directive, and examining the relationships between key pieces of regulation. This shift is demonstrated in the new EU fertilizer regulations, expected later in 2018, which will include organic fertilizers such as composts for the ﬁrst time and are also expected to provide EU-wide end-of-waste criteria for recovered nutrients. This important development, which aligns fertilizer and waste regulation, will greatly reduce the complexity of introducing waste-derived fertilizers to the market. Phosphorus is included on the list of critical raw materials, or materials that reach or exceed thresholds for both economic importance and supply risk. Europe is almost entirely dependent on phosphorus imports; therefore, the opportunity to recover phosphorus within Europe will greatly reduce supply risk. One of the key forms of recovered phosphorus is struvite – a crystal comprised of phosphorus, nitrogen, and magnesium. Struvite recovered from waste or wastewater has a key role to play in supply, and its value in food production and environmental protection is enhanced due to its properties and mode of action; unlike most phosphate sources, struvite is not water soluble, resulting in reduced runoff and improved plant uptake. Phosphorus recovery is gaining momentum in Europe. There are roughly 50 permanent phosphorous recovery plants in Europe currently, half of which have been commissioned in the last 4 years. However, this development only addresses a tiny proportion of Europe’s 30,000 wastewater treatment plants, around 2,000 of which are considered to be large enough to make phosphorus recovery economically feasible today. To accelerate this development, some countries are mandating phosphorus recovery from municipal wastewater sludges; Switzerland, Germany, and Austria have all passed national regulations within the last 2 years that compel larger wastewater treatment plants to recover phosphorus. Not all action is driven by regulation; in the Netherlands, the water boards have set up a collaborative network organization called Energy & Raw Materials Factory (Energie- en Grondstoffenfabriek) in recognition of the potential to recover valuable resources from wastewater. 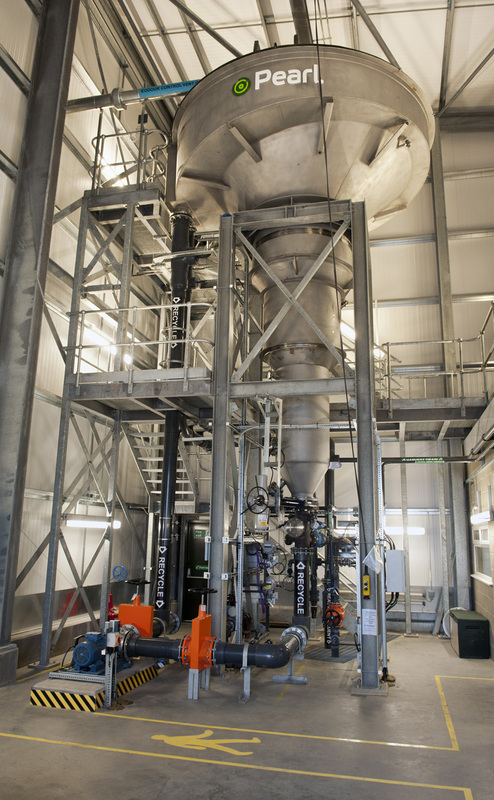 More than 20 plants are now recovering energy, nutrients, cellulose, bioplastics, biomass, algae, carbon dioxide (CO2), and/or proteins to list a few, putting the Netherlands ﬁrmly at the forefront of wastewater resource recovery. The potential for and preferred method of phosphorus recovery depends on existing wastewater treatment plant infrastructure. Wastewater treatment plants that have a phosphorus limit have two basic choices: they can either dose chemicals (typically iron or aluminium salts) to precipitate the phosphorus, or they can remove it biologically in a process known as enhanced biological phosphorus removal (EBPR). In both cases, the phosphorus is diverted into the sludge; however, chemically bound phosphorus is typically not readily available for recovery without ﬁrst undertaking processes such as acid leaching. On the other hand, the bacteria in EBPR sludges will naturally release the phosphorus in soluble form when they are exposed to anaerobic conditions – such as an anaerobic digester, which is the most common treatment method for wastewater sludges in Europe. In this way, sites operating EBPR and anaerobic digestion lend themselves perfectly to phosphorus recovery. The majority of phosphorus recovery installations operating today are in the municipal wastewater sector and recover phosphorus in the form of struvite from sludge or sludge liquors. Lifecycle analyses have demonstrated that struvite is currently the most attractive phosphorus recovery option, but its feasibility depends upon the suitability of the infrastructure as outlined above. Markets that have relatively new infrastructure, such as Poland, have widespread EBPR, creating excellent potential for struvite recovery, whereas markets that mainly rely on chemical phosphorus removal such as Switzerland or Germany would require substantial investment in upstream processes to make struvite recovery a reality. For this reason, the recovery of phosphorus from incinerator ash is gaining momentum. While the processes and associated economics are less clearly established, the countries that have mandated recovery are heavily and/or increasingly dependent on incineration, creating a strong driver for technology development and innovation in this area. So why isn’t EBPR more widely adopted, given the obvious environmental beneﬁts associated with reducing chemical usage and the potential it creates for proven, cost-effective phosphorus recovery techniques? There are multiple barriers to adopting EBPR ranging from space to operational complexity and concerns about plant reliability. EBPR plants typically have a larger footprint although new technologies that can be retroﬁtted into existing plant footprints and even into existing assets are gaining traction. The question of operational complexity, on the other hand, is not limited to EBPR; the water industry is facing the reality of operating an increasingly complex asset base, which is driving the need for more highly skilled operators. Perhaps the most fundamental question when considering EBPR adoption is one of reliability. Chemical phosphorus removal is inherently stable and predictable; however, biological processes are sensitive to a range of factors and can be upset by changes in inﬂuent wastewater characteristics or ambient temperature, for example. This is where the regulatory framework comes into play. EBPR lends itself well to a situation within which phosphorus discharge consents are based on seasonal or annual average discharge limits such as in the Netherlands. However, the pass/fail consent system currently in place in Germany is more restrictive and is undoubtedly a major factor that has led to chemical P removal as the preferred option for the majority of treatment plants. Phosphorus recovery from wastewater has been subject to much innovation over the past two decades or so, and the trend looks set to continue. Ash-based processes are developing rapidly, and the dominance of chemical P removal is giving rise to a new wave of technologies that are able to release chemically bound P to make it available for recovery as struvite. While these processes are still in the early stages of development and testing, they could potentially open substantial new avenues of recovery. There is no easy solution, no single culprit, no single savior. As one of the few measurable impacts, point source wastewater treatment plants may be under greater scrutiny than others, but such scrutiny is a challenge that has quickly become an opportunity for leadership, evidenced by the sector’s shift to a resource recovery mindset as leaders guide us toward new solutions in the ecological century. Andrea Gysin is managing director for Europe at Ostara Nutrient Recovery Technologies and is based in London, England. Ostara has 15 nutrient recovery facilities in operation worldwide including three in Europe in the Netherlands, Spain, and the United Kingdom. The company is headquartered in Vancouver, British Columbia, Canada. (www.ostara.com).